While the name "bearded dragon" can be applied to any of the seven species in the genus Pogona, it's most often used to describe Pogona vitticeps, the bearded dragon species most commonly kept as pets. Flat-headed agama lizards (Agama mwanzae) can also be kept in the home. A number of differences distinguish these two species from one another. One of the most noticeable things about flat-headed agama lizards is their impressive coloration. Their heads, necks and shoulders are bright red, while the rest of their bodies are deep blue -- they've been nicknamed the Spiderman lizard due to their color resemblance to that of the comic book character. By contrast, bearded dragons are quite plain. Their coloring generally ranges from a dull brown to tan, with some small red or gold highlights. However, only male flat-headed agamas have such such bright coloring -- females are sandy brown, not far removed from the color of bearded dragons. In the wild, bearded dragons and flat-headed agama lizards reside in different ranges. While bearded dragons live in eastern and central parts of Australia, flat-headed agamas can be found across parts of Africa, including Tanzania, Rwanda and Kenya. Bearded dragons can live in a variety of habitats, from dry forests to deserts to scrubland. As semi-arboreal creatures, much of their time is spent in the trees. Flat-headed agamas live only in areas of scrubland and semi-desert. They're often seen basking on rocks. While bearded dragons are quite slow and generally docile toward humans, flat-headed agamas are fast-moving and wary of people. If you want a lizard you can easily handle and allow to roam outside his vivarium, a bearded dragon is the better choice. Flat-headed agamas should be handled minimally and are liable to escape if given the chance. Male bearded dragons use their beards to attract mates, whereas male flat-headed agama lizards use their bright coloration. 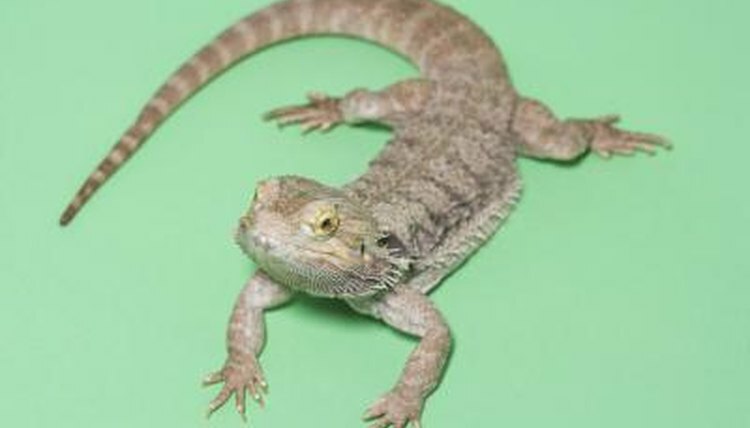 Both bearded dragons and flat-headed agamas can eat a variety of different insects, but beardies should be offered some fresh greens daily, such as collard greens, mustard greens and bok choy. While flat-headed agamas are rarely larger than 12 inches long, bearded dragons can reach up to 24 inches -- so they may need bigger tanks or vivariums. As a semi-arboreal species, beardies prefer to have plenty of branches in their enclosure for climbing.